Most people who stop at St. Mark’s Square in Zagreb’s Upper Town are there to see the church of the same name and its terrific tile roof with the coat of arms of Zagreb and of the defunct Triune Kingdom of Croatia, Slavonia and Dalmatia. The museum is housed in an 18th-century palace. Judging by attendance numbers , it seems that most of them neglect to walk down one block to Hrvatski Muzej Naivne Umjetnosti, or the Croatian Museum of Naïve Art (only about 15,000 people per year visit this museum), and they’re missing out on something special. Naïve art “has outlasted the ever-changing variety of aesthetic styles” throughout history, according to The World Encyclopedia of Naïve Art, and that claim seems spot on. Considering that this style has almost always been created by artists without a degree or any formal training, you could date it back to cave paintings in prehistoric times and take it through the 1900s, when dozens of nations around the world were producing naïve artists. These artists are not merely weekend hobbyists. They are accomplished craftsmen and craftswomen, and in Croatia their tradition reaches back at least to 1931, when their works were first showcased in an exhibition in which they strove to prove that the upper classes in urban areas did not hold a monopoly on talent and that the creation of art was not restricted to those with proper schooling and a degree. These artists were ordinary Croatians — rural peasants, shopkeepers, clerks, and farmers who often portrayed agrestic landscapes. Later on, the form expanded when idealized countrysides, portraits, architectural panoramas, and darker themes began to emerge, joining the rural realism of earlier works. Established as the Peasant Art Gallery in 1952, the current Croatian Museum of Naïve Art is the world’s first museum dedicated to this genre. 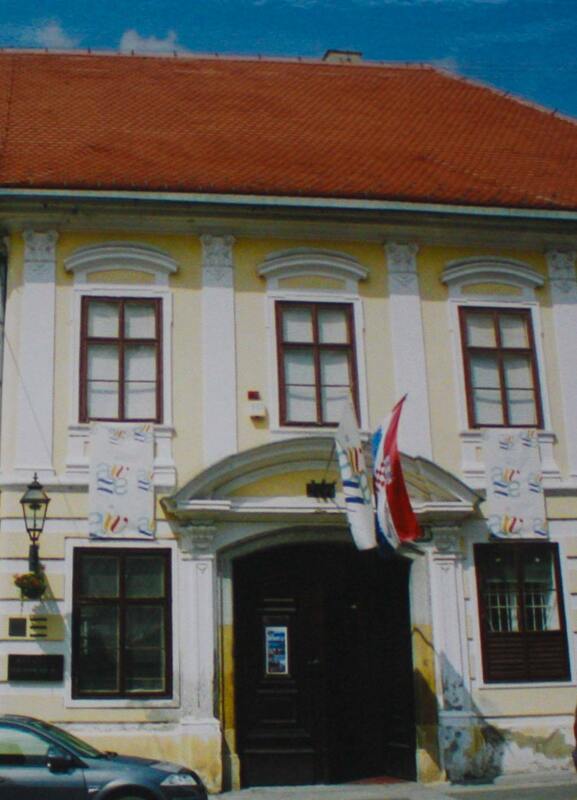 Housed on the first floor of the lovely 18th-century Raffray Palace, the museum’s collection totals just under 2,000 paintings, sculptures, drawings, and prints, of which only about 100 — mostly by Croatians— are on display at any given time. Untrained artists produced dynamic works such as Swineherd. Like the works of other naïve artists, the Croatians’ creations usually defy the rules of perspective developed during the Renaissance — a decrease in both the size and details of objects, and the muting of colors, proportionally with distance. As a result, their works are often geometrically askew, more like medieval paintings; highly detailed, where nothing gets lost in the background; and saturated with color. Of these, vivid color was the first component that attracted me to the individual pieces here. In the architectural paintings of Emerik Feješe, such iconic buildings as Milan Cathedral, the Basilica of St. Mark in Venice, and the Parliament in Budapest come alive like something you might create with a Lite-Brite light box in unrealistic but captivating colors without compromising the architectural integrity of the structures. Evangelists on Calvary is a gruesome and utterly riveting masterpiece. Color also comes to the fore in any number of pastoral settings. In Ivan Rabuzin’s simplified and predominately bulbous On the Hills — Primeval Forest, strong greens and blues boldly present a soothing landscape. 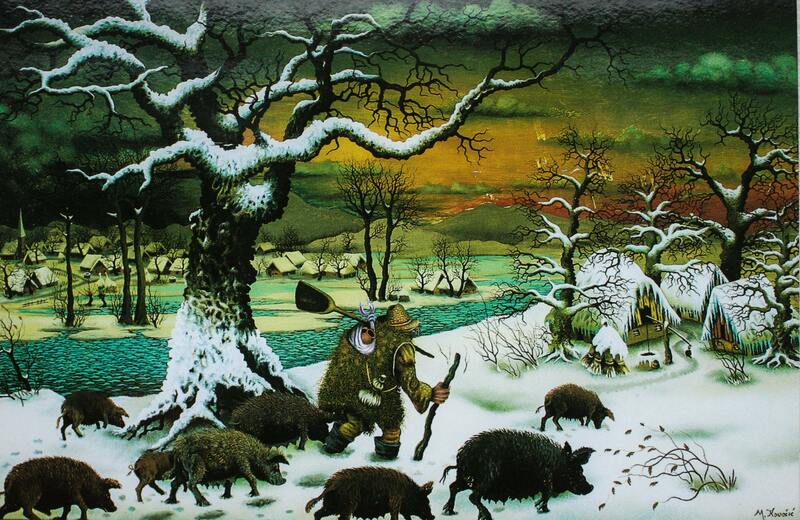 Mijo Kovačić’s Swineherd follows a herd of swine and their lone herder along the icy blue of a curving river that leads the eye to a fiery sunset behind dark, bare trees and village homes covered in snow. In an unusual departure from the characteristic employment of vibrant colors, Ivan Lackovič Croata creates a more subtle sky in Big Autumn, a perfect reproduction of what you might view out the window of your country home on a dreary day in late fall. The most riveting work, awash in audacious colors, presents a familiar scene in an astounding way. 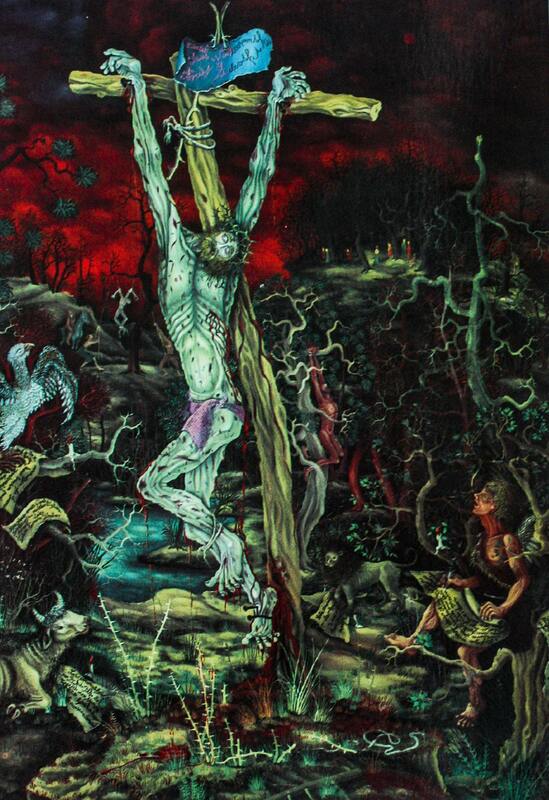 Ivan Večenaj’s 1966 painting Evangelists on Calvary is disturbing to look at and utterly impossible to turn away from. Front and center is Christ’s elongated, sinewy, grayish body on the cross, ribcage highly visible and wearing a crown of thorns, with a copious amount of blood pouring from his wounds onto the cross and the ground below. The Four Evangelists appear on either side in their symbolic form — the winged man for Matthew, the winged lion for Mark, the winged ox for Luke, and the eagle for John, all with their gospels laying next to them. Behind the cross, the twisted bodies of the two thieves who were crucified beside Christ hang torturously from gnarly trees rather than crosses. Violent storm clouds in the upper-left corner and the angry blood-red sky intensify the turbulent scene. It was a haunting image to depart with, but when I left the museum, I was thoroughly pleased that I was one of the comparatively few visitors to Croatia’s capital to appreciate these wonderful works of naïve art and to expand my knowledge of the style beyond Grandma Moses. Thanks for taking us on your journey. I love the way you write and explain everything. I can picture it like I am there seeing it for myself. Thanks, Eileen. Some things speak for themselves. Hope you can go there someday!